I’m thrilled to announce that Harmony Bench and I have been awarded funding by the Arts and Humanities Research Council (AHRC) for a three-year research project that continues the work of this blog, and our more recent collaborative projects, Dance in Transit and Movement on the Move. Dunham’s Data: Katherine Dunham and Digital Methods for Dance Historical Inquiry will be studying how dance moves both across geographical locations and across networks of cultural, artistic, and financial capital through the case study of Katherine Dunham, as well as the kinds of questions and problems that make the analysis and visualization of data meaningful for dance historical inquiry. The project will be carried out with UK industry partners One Dance UK’s Dance of the African Diaspora and the Victoria & Albert Museum, as well as via international knowledge exchange partnerships with digital projects at OSU (US), Ludwig Maximilians Universität Munich (Germany), and the University of New South Wales (Australia). A new project website will be up shortly, but in the meantime, here is the press release. I am redoing the relational map from Mapping Tours through the Dancers’ Eyes for the article that I’ve written with Harmony Bench on “Mapping Movement on the Move: Dance Touring and Digital Methods,” which is forthcoming in the Theatre Journal special issue on digital methods. This involves updating the dataset, and also clarifying the map-based visualization. I’ll detail the changes involved, but if you want to look first and read later, then here is the link. First, I wanted to get more granularity from the pseudonymous manuscript, “Old Granny Spreads Goodwill.” One step of this was characterizing the associations themselves, so that the results can later be filtered. Dancers are comparing places to one another, but they are also making associations to places in other ways places, for example by means of people they meet. The new dataset includes such types as “PlacetoPlace,” “PersonMetOrigin,” “Reference,” and “Language.” I am still bypassing associations made to the factual history of a place, although this is complicated because I am have chosen to include certain associations where, for example, colonial histories impact experiences of everyday life in the present. These are then given two further annotations. The first is “weak” versus “strong,” signifying the difference between a reference made offhand in passing versus one that is very particular. The second, where appropriate is “negative” versus “positive,” in other words whether the association is based on likeness versus unlikeness. Rebuilding this dataset reinforces the promises and limitations of looking at an archival document in this way. Something I had not spotted before is that the full dataset contradicts one of the claims within the manuscript from which it is built. The author William Dollar observes that the travelers go for long periods of time without thinking of World War II going on simultaneously in Europe. This has always struck me as a reminder of the ways in which I am relying on his singular voice to report for a group, in particular because two of the dancers were themselves now-stateless Germans and unlikely to be disconnected in the way that Dollar represents. However, once I catalogued all of the different types of connections, references to Germany appear more than any country other than the United States (and it’s a close second). At the same time, something that becomes clear is how the local tends to be less marked. For example, there are ongoing references to the Spanish and Portuguese languages, but these are so ubiquitous that it is difficult to tie them to a place in the same way that I can with French or Russian. The second goal of this redoing has been to clarify the map-based visualization, in particular how the associations catalogued by the dataset become visible. One of the things I am currently grappling with is how to represent the difference between a reference made to a very specific place, say the Paris Opera, versus one made to a country or even continent. For this, I am exploring the possibilities of using polygons, or alternately varied ways of representing the endpoints of the line strings. Likewise, I am interested in making visible certain of the additional parameters, such as the strength or weakness of connections, which can represent the relative difference and weight of various associations as points of reference. This also includes being able to filter the associations by type, such as people met, which will help to particularize the ways in which this relational map is being held together. I am working with cartographer Eric Sherman to find ways to make clearer the narrative that is being visualized by the lines that I previously drew as part of the earlier, poster-form map. If one of the most important takeaways of the original map was how the dancer’s frames of reference changed along the way, then this is best visualized in a time-based manner. For this we are exploring animation, as well as other means to demonstrate the directional flow of connections. (One great model I’ve been thinking about for direction is Tim Tangherlini and Peter Broadwell’s GhostScope). One of the early experiments involved numbering parent nodes from which associations are being made chronologically, and then gradiating the lines radiating from them, so that connections drawn from the earliest stops are lightest, while connections from later stops become increasingly dark. For example, in the draft image above (zoomed in on Buenos Aires), the lightest lines are the associations made while dancers are in the city, whereas the various shades of darker lines come from later cities for which Buenos Aires functions as a child node, beginning with Santiago to the west. Check it out! Clicking on the map will also open the interactive visualization in a new browser window. Finally, this is not for the Theatre Journal article, but one of my questions all along has been how a document like this silly manuscript might help us to skew representations of the world as a whole, in order to depict it from the traveler’s perspectives. To this end, Eric recently sent me a sketch for a different way to visualize the association dataset. If you look at the blue and yellow image below, you’ll see that what he has done is to generate polygons defined by borders that connect each parent node and all of its children. The idea is to show the total global space that is more and less encompassed by Dollar’s frame of reference for the world, location by location. The image at the top of this post uses the cumulative effect of all of these polygons to illuminate a world map. On one hand it offers a reminder of just how much of the world map is touched in some way by this small South American tour, but on the other it also serves as a reminder of all of the places that remain in the dark for Dollar. Ps: just in case you haven’t seen enough things, I made a little network graph in Palladio that connects parent nodes to most of* their child nodes’ coordinates. (*Palladio requires latitude and longitude to be flipped, so these are only the locations that are recognizable when reversed, so I didn’t have to reformat my whole dataset). One of the things on my to-do list has been to collide my touring data with other available datasets from 1941. In the long term, such digital work not only offers new ways to analyze dance history, but also points up new ways to make dance materials available to historical studies in other fields. Unfortunately, very little historical data from the tour year is already collated online. But I did use a combination of the World Almanac and Book of Facts from 1941 and 1942, together with the 1941 Rand McNally Commercial Atlas to construct a little dataset of populations for the cities in which American Ballet Caravan performed. I then ran these against the number of shows performed in each city, in order to see whether any stood out as anomalies. For this map, I have divided the color of the cities by standard deviations above or below the mean. The farthest outliers are -2 and +3. The dataset is not really large enough to support a high level of confidence, but it at least gives some sense of outliers. Here it’s possible to compare Mendoza, where 3 shows were performed for a population of 76,780 to Rosario, where 2 shows were performed for a population of over half a million, or Sao Paulo, which had 4 shows for 1,151,249 residents. Medellin comes out at precisely the mean. So why did they do so few shows in Sao Paulo? Or so many in Mendoza? The map is color coded by standard deviation, with relevant information (city, population, and number of shows) appearing on the hover. Up until now, I have been working with relatively generic contemporary baselayer maps. But I was interested to see how different certain older maps might be, given some of the political upheaval in South America in the past 80 years. Of course, however, I first had to get lost in the fabulousness of the historical maps themselves. 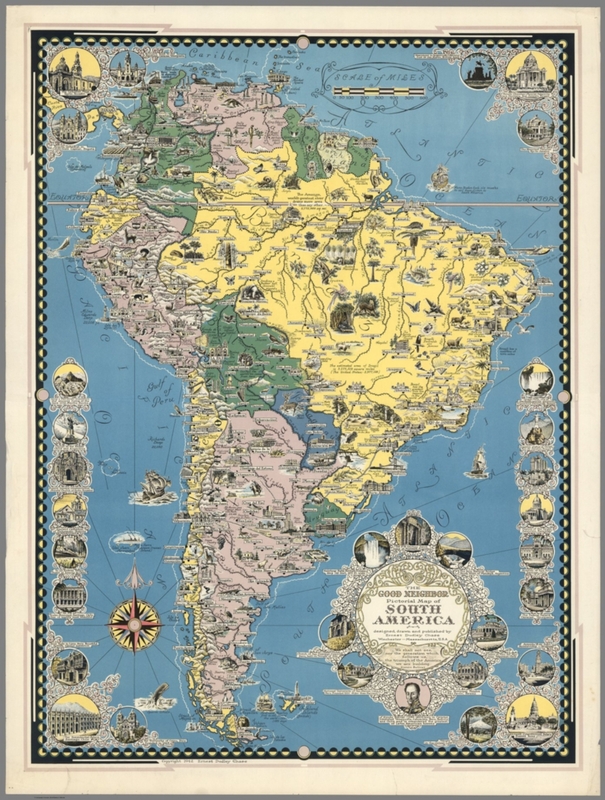 For example (and extremely apropos), in 1942 Ernest Dudley Chase published what was called the “Good Neighbor Pictorial Map of South America.” While one digital collection explains that this was meant to offer up “a positive message of solidarity between South America and the U.S.”, another indicates that it was used by the Moore-McCormick Lines. This was in fact the ocean liner company that American Ballet Caravan used between New York and Rio at the start of their tour. Other maps were created for different uses, such as this 1942 physical-political classroom map, designed for viewing from up to 40 feet away (and used in UC Berkeley’s Department of Geography). For the moment, I have started with a Rand McNally road map from 1941. Unfortunately none of the pre-referenced maps in the extensive David Rumsey Map Collection corresponded closely enough to locations and dates. But the collection does allow users to contribute their own georeferencing, so I started working on the road map with some clumsy correlations of my own. Mike then took the next step to develop a Mollweide projection, that he then rubbersheeted to match some prominent cities. He also wrote me out a tutorial in the process. The historical maps do more than simply provide an accurate baselayer. For example, I have been wondering about some of the empty spaces on the maps that I have been creating so far. In other words, where didn’t the tour go and why? Or why choose these particular cities? I have been searching for other open datasets pertaining to South America in 1941, which might help answer such questions via population, GDP, etc. However, looking at the 1941 atlas, it is conspicuous that the most dominant lines and therefore the largest roads on the map trace out almost exactly the path taken by American Ballet Caravan (even though the company itself often traveled via other means). I’ve turned on the breadcrumbs in the cumulative animation, so that this pattern is visible.